Carl von Clausewitz: ON WAR. Table of Contents. NOTE: This version of Carl von Clausewitz's famous treatise On War is the only complete (i.e., it contains all eight books, etc.) on-line posting of the long-obsolete J.J. Graham translation published by Nicholas Trübner in London in 1873. It is derived from the German original, Clausewitz's Vom Kriege (Berlin: Dümmlers Verlag, 1832). The 1976/84 Howard/Paret translation from Princeton University Press is the standard English translation today; for the most accurate text one should always consult the Otto Jolles translation, originally done in 1943 at the University of Chicago. For more information on the original German text and on all of the available English translations, click HERE. Please take a look at the relevant books shown below. 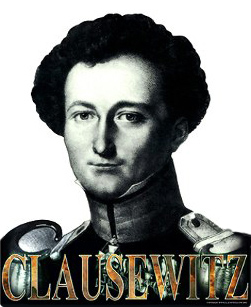 For a general discussion of the various versions of Vom Kriege/On War available, see Clausewitz.com, "Which Translation of Clausewitz's On War do you have?" For an advanced and rather complex discussion of some important specific problems with the English translations (including Jolles'), see Christopher Bassford, "Clausewitz's Categories of War and the Supersession of 'Absolute War.'" Carl von Clausewitz and Arthur Wellesley, First Duke of Wellington, On Waterloo: Clausewitz, Wellington, and the Campaign of 1815. Ed./trans. Christopher Bassford, Daniel Moran, and Gregory W. Pedlow (Clausewitz.com, 2010). ISBN: 1453701508. This book is built around a new and complete translation of Clausewitz's study of the Waterloo campaign (Berlin: 1835), which is a strategic analysis of the entire campaign (not just the Battle of Waterloo), and the Duke of Wellington's detailed 1842 response to it. Clausewitz's Der Felzug von 1815 was written late in his life and its findings were never incorporated into On War, so most readers will find it new material. Buy the best translation—recommended for serious readers. The Book of War (The Modern Library, February 2000). ISBN: 0375754776. Clausewitz's On War and Sun Tzu's Art of War in one volume. 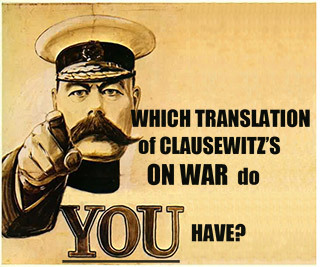 The translation of Clausewitz's On War is the 1943 version done by German literary scholar O.J. Matthijs Jolles at the University of Chicago during World War II—not today's standard translation, but certainly the most accurate. Sun Tzu is presented in the modern translation by Roger Ames, based on complete ancient texts found by archaeologists. • 1. What is War?